The great apostle was a Jew of the tribe of Benjamin. He surpassed all his peers in zeal for the Jewish law and their traditions, which he thought to be the cause of God, became one of the most fierce enemies and persecutors of Christians. He was one of the conspirators in the martyrdom of St. Stephan. 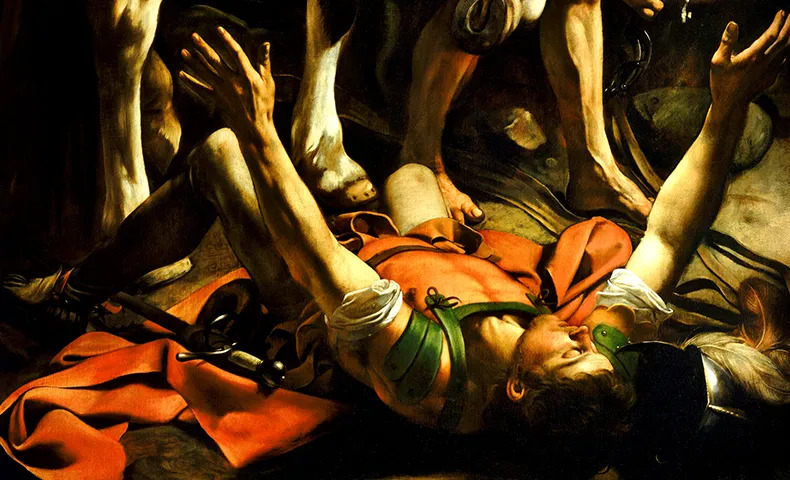 After the martyrdom of the holy deacon, the priests and magistrates of the Jews raised a violent persecution against the church at Jerusalem, in which Saul placed himself above the others. In the fury of his zeal, he appealed to the high priest and Sanhedrim for a commission to take up all Jews at Damascus who confessed Jesus Christ, and bring them bound to Jerusalem, that they might serve as public examples to incite terror into others. But God was pleased to show forth in Saul his patience and mercy: Saul was almost at the end of his journey to Damascus, when, around noon, he and his company were surrounded by a great light from heaven and, fell to the ground. Then Saul heard a voice, which to him was articulate and distinct, but not understood by the rest :"Saul, Saul, why dost thou persecute me? Christ said not: Why dost thou persecute my disciples, but me: for it is he, their head, who is chiefly persecuted in his servants." Saul answered: "Who art thou, Lord?" Christ said: "Jesus of Nazareth, whom thou persecute. It is hard for thee to kick against the goad: - to contend with one so much mightier than thyself." There was a Christian of distinction in Damascus, Ananius, greatly respected by the Jews for his irreproachable life and great virtue. Christ appeared to this holy disciple, and commanded him to go to Saul, who was at that moment in the house of Judas at prayer. Ananias trembled at the name of Saul, being familiar with the misdeeds he had done in Jerusalem and the errand for which he set out to Damascus. But our Redeemer overruled his fears, and charged him a second time to go, saying: "Go, for he is a vessel of election to carry my name before Gentiles and kings, and the children of Israel: and I will show him how much he has to suffer for my name. For tribulation is the test and portion of all the true servants of Christ." Thus a blasphemer and a persecutor was made an apostle, and chosen to be one of the principal instruments of God in the conversion of the world. St. Paul never recalled his wonderful conversion, from which have poured forth may blessings, without raptures of gratitude and praise to the Divine and His mercy. The Church, in thanksgiving to God for such a miracle of his grace, to commemorate so miraculous an instance of his almighty power and to propose to penitents a perfect model of a true conversion, has instituted this feast, which we find mentioned in several calendars and missals of the eighth and ninth centuries, and which Pope Innocent III commanded to be observed with great solemnity.